Asbestos 147 Appendix D: Asbestos "Asbestos" describes six naturally occurring fibrous minerals found in certain types of rock formations. When mined and processed, asbestos is typically sepa- rated into very thin fibers that are normally invisible to the naked eye. They may remain in the air for many hours if re- leased from asbestos-containing material (ACM) and may be inhaled during this time. Three specific diseases — asbestosis (a fibrous scarring of the lungs), lung cancer, and mesothelioma (a cancer of the lining of the chest or abdominal cavity) — have been linked to asbestos exposure. It may be 20 years or more after exposure before symptoms of these diseases appear; however, high levels of exposure can re- sult in respiratory diseases in a shorter period of time. Most of the health problems resulting from asbestos exposure have been experi- enced by workers whose jobs exposed them to asbestos in the air over a pro- longed period without the worker protec- tion that is now required. Asbestos fibers can be found nearly everywhere in our environment (usually at very low levels). While the risk to occupants is likely to be small, health concerns remain, particularly for the custodial and maintenance workers in a building. Their jobs are likely to bring them into proximity to ACM and may sometimes require them to disturb the ACM in the performance of maintenance activities. EPA estimates that "friable" (easily crumbled) ACM can be found in an esti- mated 700,000 public and commercial buildings. About 500,000 of those build- ings are believed to contain at least some damaged asbestos. Significantly damaged ACM is found primarily in building areas not generally accessible to the public, such as boiler and mechanical rooms, where asbestos exposures generally would be limited to service and maintenance work- ers. However, if friable ACM is present in air plenums, it can be distributed through- out the building, thereby possibly exposing building occupants. When is asbestos a problem? Intact and undisturbed asbestos materials do not pose a health risk. The mere presence of asbestos in a building does not mean that the health of building occupants is endan- gered. ACM which is in good condition, and is not damaged or disturbed, is not likely to release asbestos fibers into the air. 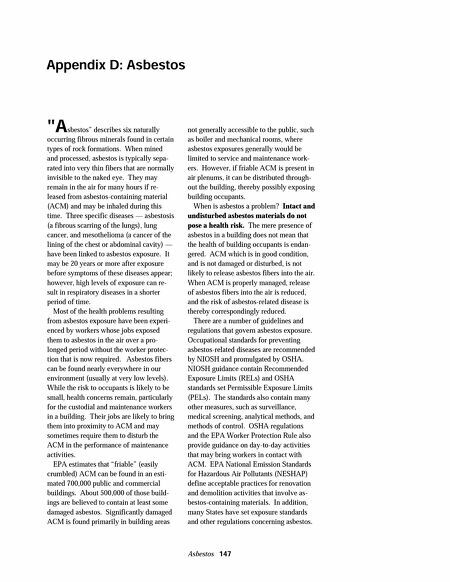 When ACM is properly managed, release of asbestos fibers into the air is reduced, and the risk of asbestos-related disease is thereby correspondingly reduced. There are a number of guidelines and regulations that govern asbestos exposure. 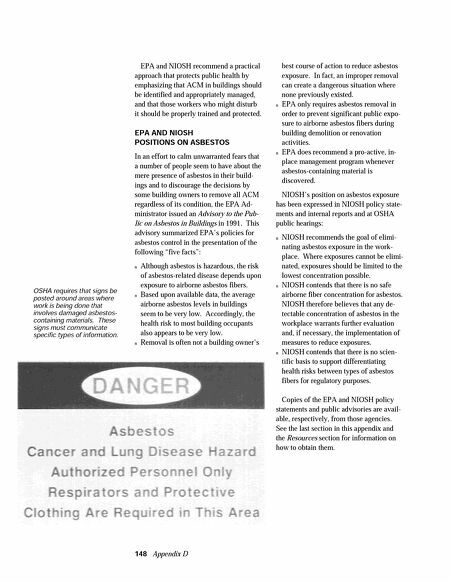 Occupational standards for preventing asbestos-related diseases are recommended by NIOSH and promulgated by OSHA. NIOSH guidance contain Recommended Exposure Limits (RELs) and OSHA standards set Permissible Exposure Limits (PELs). The standards also contain many other measures, such as surveillance, medical screening, analytical methods, and methods of control. OSHA regulations and the EPA Worker Protection Rule also provide guidance on day-to-day activities that may bring workers in contact with ACM. EPA National Emission Standards for Hazardous Air Pollutants (NESHAP) define acceptable practices for renovation and demolition activities that involve as- bestos-containing materials. In addition, many States have set exposure standards and other regulations concerning asbestos.